Comments: American mink are long and slender with short legs. They have soft, brown fur with white spots on their chin, throat or chest and a tail with a bushy tip. They make their dens beneath riverbank tree roots, in hollow trees and logs and in abandoned muskrat and beaver dens. They are excellent swimmers that search for prey in or near water from dusk to dawn. Females bear litters of 4-5 kits in early summer. Their longevity in the wild can reach 6 years. Distribution: American mink are found from the eastern two-thirds of the United States through Canada and most of Alaska. They are found statewide in Kansas near aquatic habitats, but less common in the western third of the state. 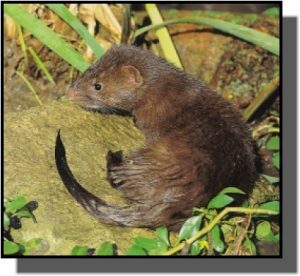 Food: American mink feed on fish, crayfish, snails, mussels, frogs, snakes, muskrats, mice and rabbits.